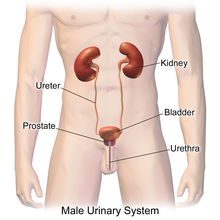 Urination is how animals and humans remove urine from their bodies. Urine is the scientific term for "pee", the liquid bodily waste filtered out of the bloodstream and from the liquids that a person drinks. The bladder temporarily holds the waste fluid. This page was last changed on 14 July 2018, at 06:46.